Adobe Digital Editions (short for ADE) is an eBook reader software program from Adobe Systems. It is used for acquiring, managing and reading eBooks as well as other digital publications. Currently most eBooks we get are in DRM protection, which locks eBooks into certain platforms so that we can only read our purchased books on specific apps and devices, and so are ADE books. Adobe Digital Editions uses the proprietary Adobe Digital Experience Protection Technology (ADEPT) Digital Rights Management scheme, which confines users to view the purchased content on up to six machines via the same Adobe ID. 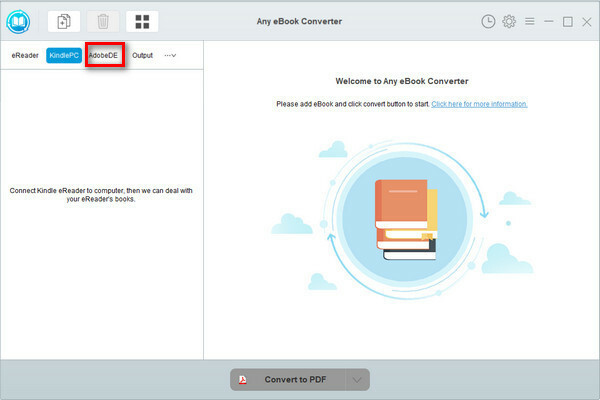 If you’d like to get rid of the limitations, to copy your ADE eBooks to computer or read them on as many devices as you like, you can simply convert your Adobe books to the widely-used PDF format. Here comes the question: How can ADE books be converted to PDF? All we need is a professional eBook converter. Below we are going to apply the most popular eBook tool – Any eBook Converter to guide you how to make it step by step. Any eBook Converter is a combination of eBook DRM removal tool as well as eBook format converter, specially designed for removing DRM from Kindle, Adobe, Kobo & Nook eBooks and converting them to DRM-free EPUB, PDF, MOBI, AZW3, TXT or KFX format in batch. Adobe Digital Editions is required to be available on your computer before running Any eBook Converter. 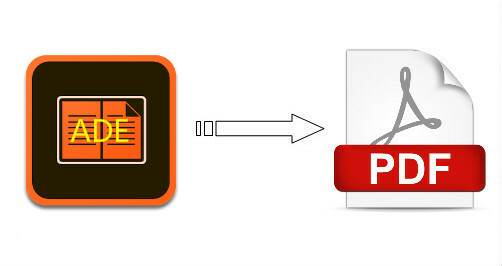 If your eBooks are .acsm files, simply open them in Adobe Digital Editions, and the real eBook files will be downloaded. If not, you need to open them in ADE, and then click “Library” button and select “Add Item to Library” to import them to Adobe Digital Editions. Below is a full demonstration of converting Adobe Digital Editions eBooks to PDF format with Any eBook Converter. Before we get started, please have the program well installed on your computer. Click "Adobe" button on the left panel. Any eBook Converter will find all the eBooks in your Adobe Digital Editions library automatically. 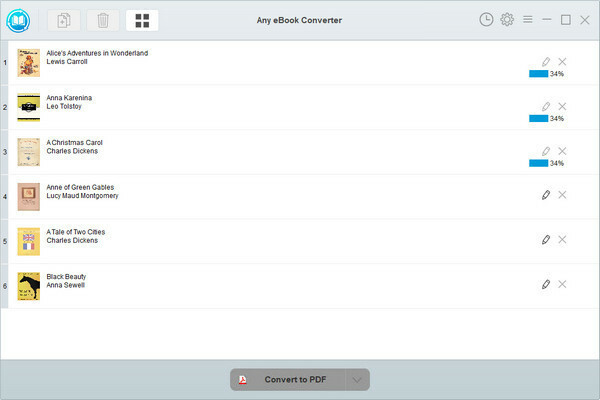 Drag and drop the eBooks you want to convert to PDF to the right panel. Note: The DRM of the eBooks uploaded to Any eBook Converter will be removed immediately once they are successfully added to the program. Click “V” icon on the bottom and select “PDF” as the output format. And by clicking the “Settings” button on the upper right, you can customize the output path for the converted books. 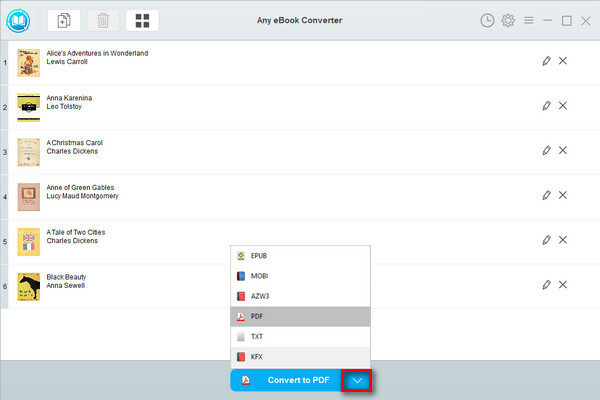 Click "Convert to PDF" button to start converting the Adobe books to PDF format. Now you've got your Adobe Digital Editions books in PDF format, you can read them on more devices and even print them out if needed. 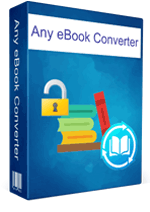 Note: The free trial version of Any eBook Converter enables users to convert one book at a time, you can unlock the amount limitation by purchasing the full version.